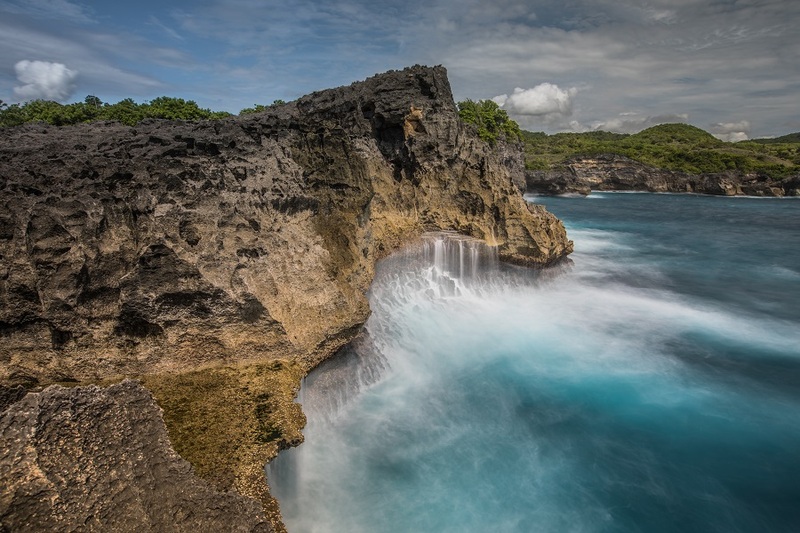 Nusa Penida is an incredibly beautiful place and offers some amazing photo opportunities. 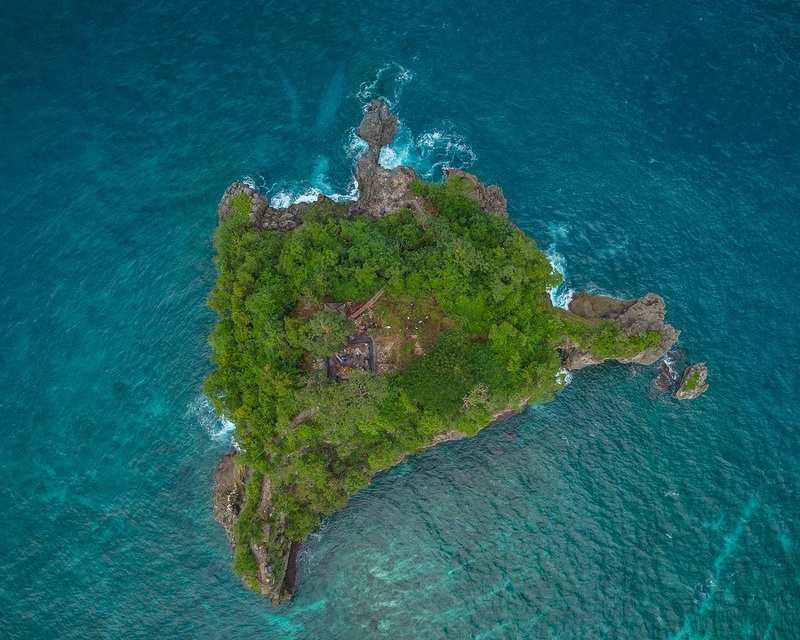 The island’s coastline is insane, unlike anything we have ever seen, and located only 45 minutes from Bali. 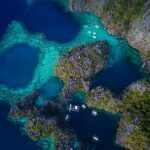 The beauty of this island is unparalleled to most places in the world; white sand beaches, unique rock formations, and cliff views made famous from Instagram. 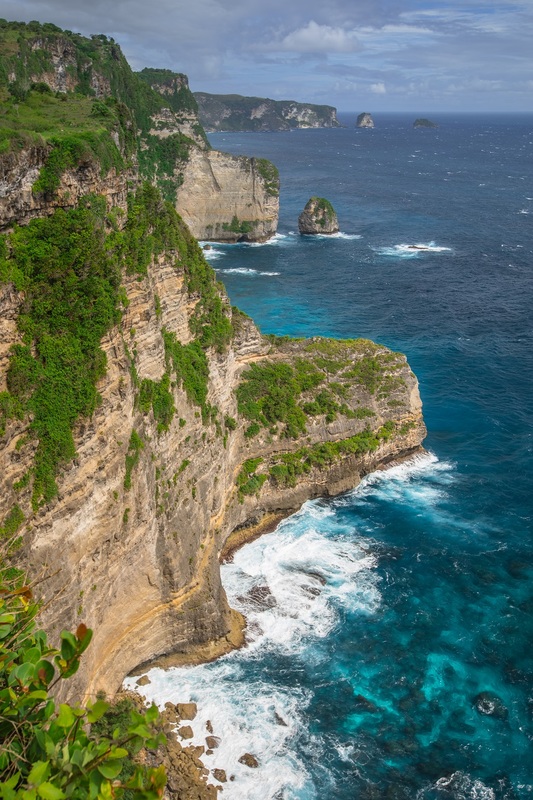 Whether coming on a day tour or independently, we got you covered with the top things to do in Nusa Penida, where to stay, and how to get around. 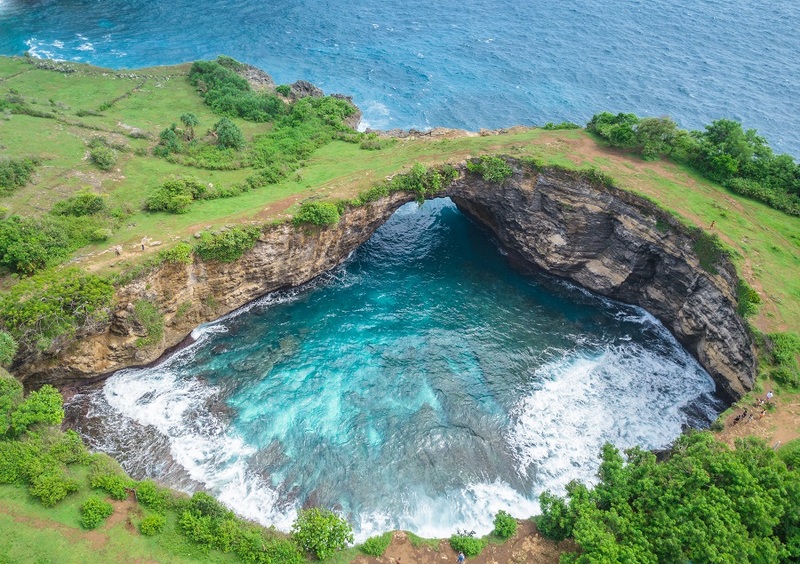 The most popular choice for visiting Nusa Penida is by organized tour. Tours include a driver, lunch, fast boat ferry rides, and stops at the four popular locations: Kelingking Beach, Angel’s Billabong, Broken Beach, and Crystal Bay. 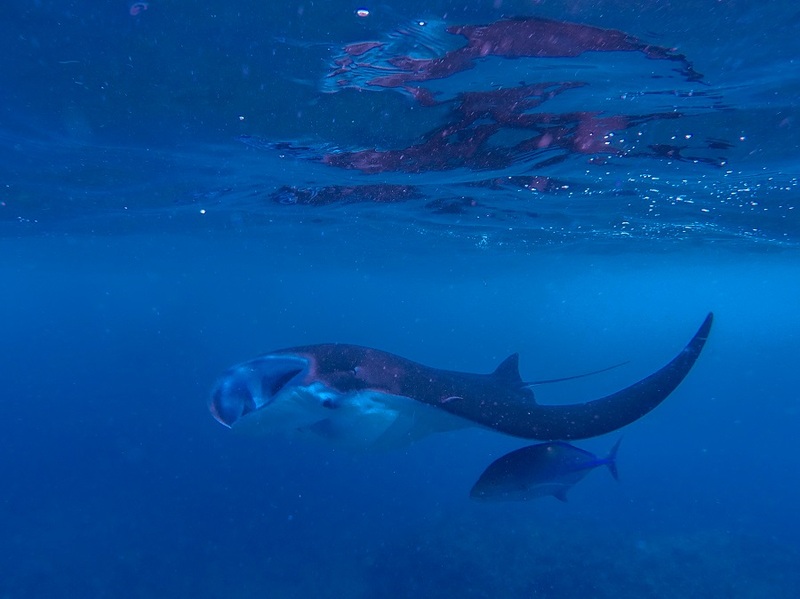 Snorkeling can be added, with a boat trip to Manta Point, to swim with the manta rays. Day trips typically depart from Sanur at 8 AM, returning around 5 or 6 PM. 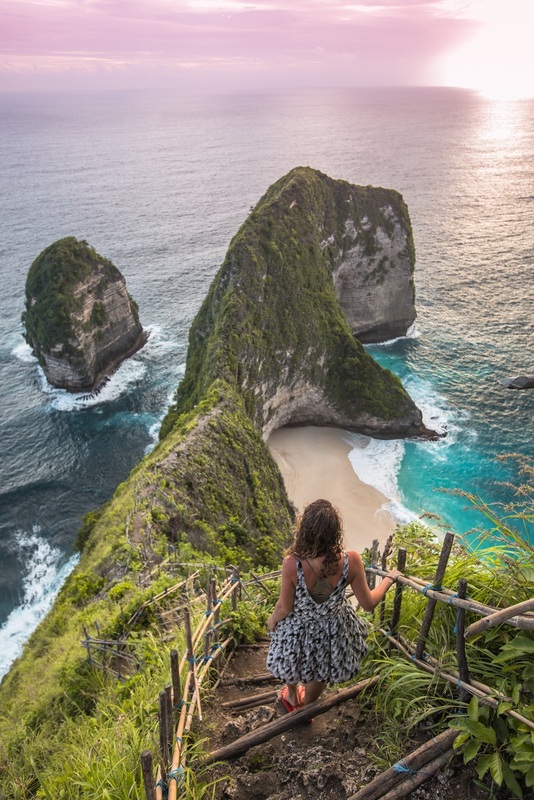 A private Nusa Penida tour starts at 700k IDR per person with a minimum of two people. There are lots of tour providers and drivers. For an excellent driver who enjoys photography and has good prices, contact Kadek at +62 858-5894-9197. Several friends went on a tour with him and really loved it. 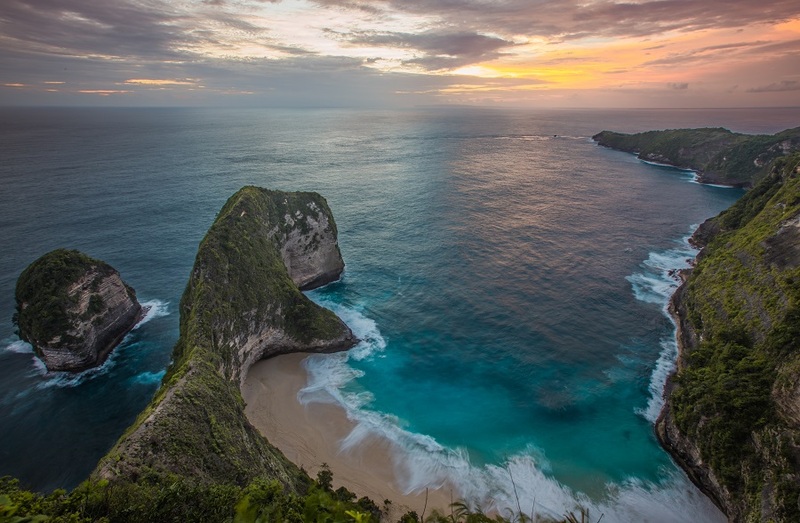 Going to Nusa Penida independently has several advantages. By joining a day tour, all the groups go to the same four locations. This makes each of those places extremely busy between 10 AM and 3 PM. Especially during the peak tourist season in July and August. Outside of those times, it gets much quieter. 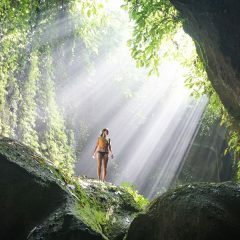 If you are into photography or just want a more peaceful way to explore Nusa Penida, going independently is the answer. When planning to visit the four main attractions you can stay one night and rent a scooter for two days. If visiting Atuh Beach, stay for 3 or 4 nights. The driving is slower and longer than expected on Penida. In some cases, especially to Angel’s Billabong/Broken Beach, the road conditions are very poor. Driving yourself in Penida should only be done by confident drivers. Upon arrival, at every port, it is possible to rent a scooter for 60,000 IDR per day. We suggest to break up the most popular sites over separate days, going before 10 AM and after 3 PM. During the day, find a beach to relax on. Helllooo Kelingking Beach…but watch out for high tide. Don’t miss the sunset at Kelingking viewpoint. ATMs are only located at the harbor towns of Toya Pakeh and Batununggul. But to be safe I would bring cash with you. The Sanur ferry terminal, located just north of Sanur Beach, is the hub for boats departing from Bali. Fast boat companies line up and down the beach with groups en route to locations such as the Gili Islands, Lombok, Lembongan, and Penida. Several fast boats go directly to Nusa Penida. Boats depart between 8 AM and 4 PM; the ride takes 45 minutes. Perama Fast Boat or Maruti Express both cost 150k IDR each way. Booking ahead or through a travel agent/hotel will cost more, up to 300K each way. It is best to arrive at the ferry terminal at 7 AM and book on your own. Boats depart several times daily between Lembongan and Penida from beneath the yellow bridge. They do not have set times and leave once the boat is full. The ride takes 10 minutes and costs 50k IDR. We were told by many companies the boat from Lembongan to Penida is very expensive, upwards of 300k. I imagine that just want a return fair. We were able to take a snorkel trip from Lembongan to Manta Bay and the surrounding areas. They agreed to drop us off at Toya Pakeh port on Penida free of charge. Win-win! 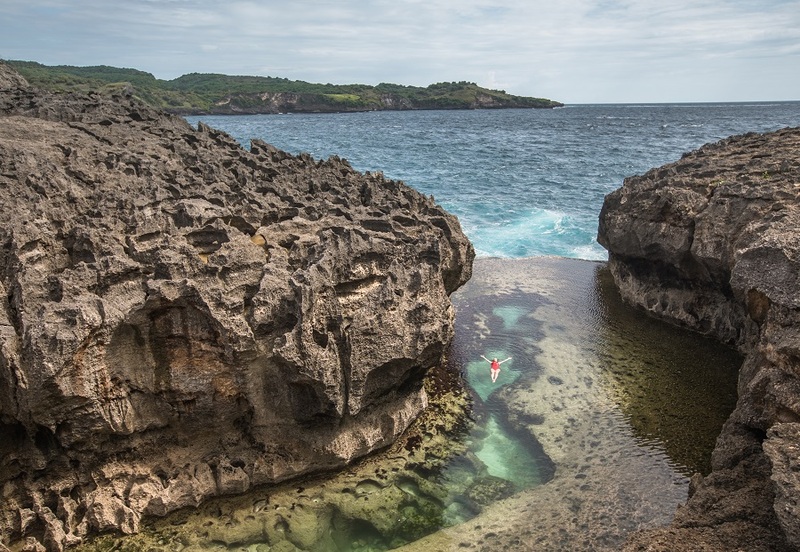 For more on Nusa Lembongan, check out our travel guide. 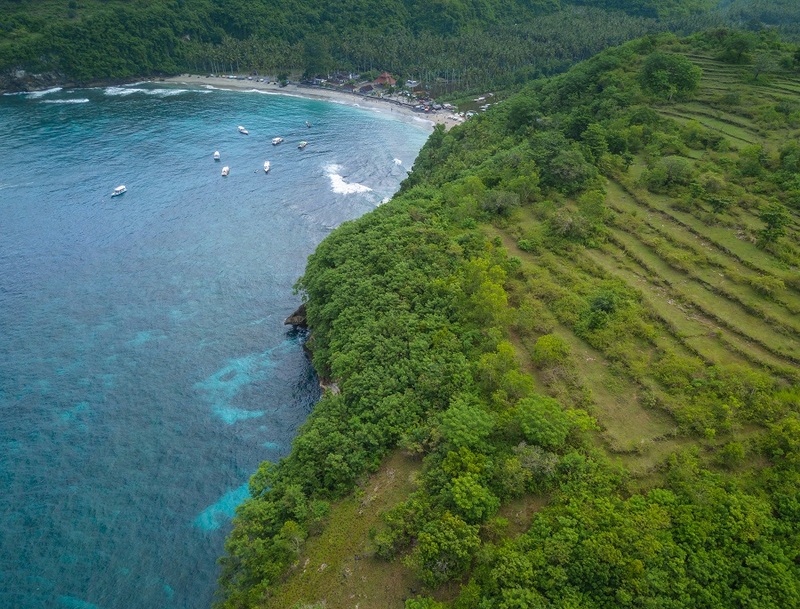 Most guesthouses and homestays are located in the northwest corner of Nusa Penida. The main cluster of accommodation is near the port of Toya Pakeh, Crystal Bay, and the town of Ped on the north coast. 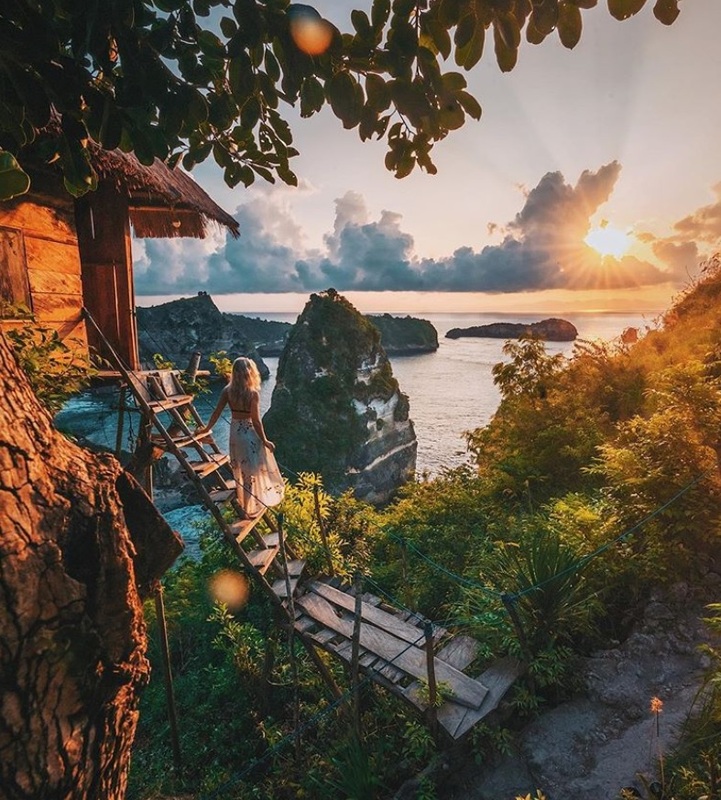 There is no accommodation on the entire south coast of Nusa Penida. We searched for it and could not find anywhere to stay. Atuh Beach has only 1 or 2 VERY basic places to stay. It is best to plan your nightly accommodation for at least one day ahead. WK Gamat Creative Resort – Grab a one-bedroom villa with breakfast and a pool for 640k IDR. 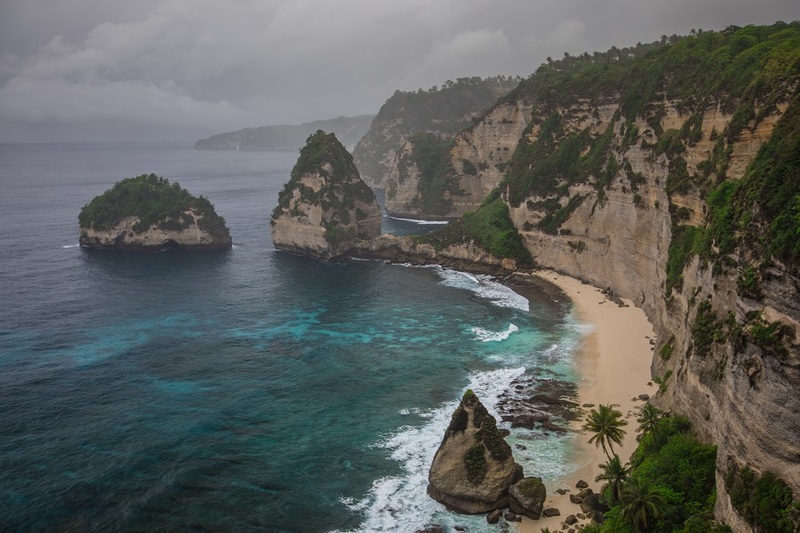 Kelingking Beach is the iconic attraction on Nusa Penida. 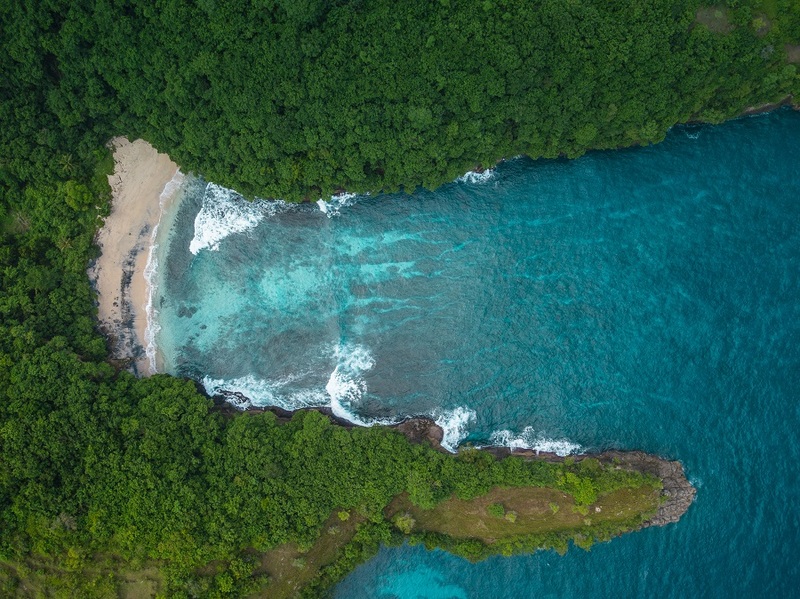 It became famous on Instagram because of this land formation and picture-perfect beach. The views are stunning and the peninsula shaped like T-rex is unlike anything we have ever seen. Massive cliffs descend down to white sand on Kelingking Beach and is definitely worth the trek down. While many tour agencies and people will say it is too dangerous to walk down to the beach, we found it to be a very straightforward hike. However, if afraid of heights this can be extremely challenging as you need to depend on bamboo stairs and steps the entire way down. It takes 30-40 minutes each way. The viewpoint gets crowded with day tours mid-day, so it is better to beat the rush and come before 11 am or wait until after 4 pm. The road to Kelingking is paved and very manageable. This is an excellent sunset spot as well. 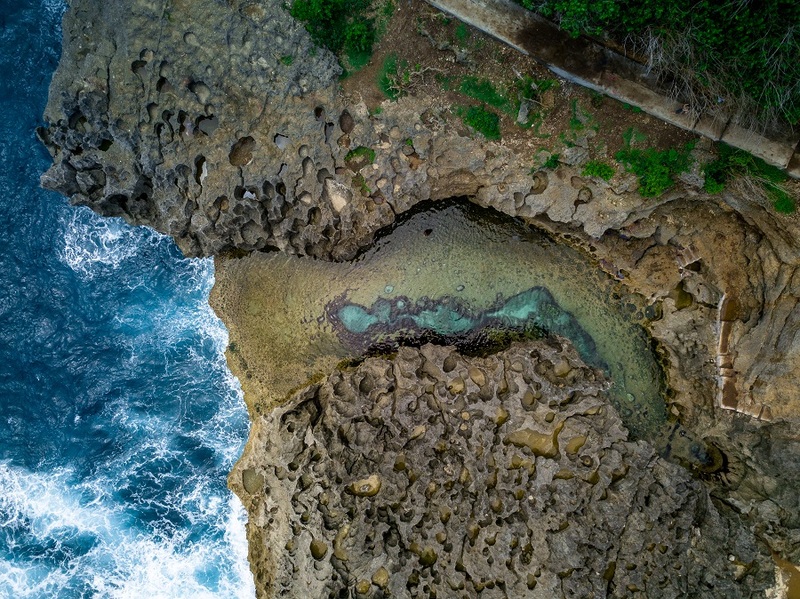 Don’t forget your swimsuit to go for a dip in this amazing tide pool. This might be one of the worst roads in Indonesia getting here, but they are paving sections of the road so it is quickly improving. A visit to the tide pool is best during low tide. Waves crash over the side of the cliff during high tide, filling up the tidal pool, making it unsafe to swim. At low tide, it is a shallow baby pool. 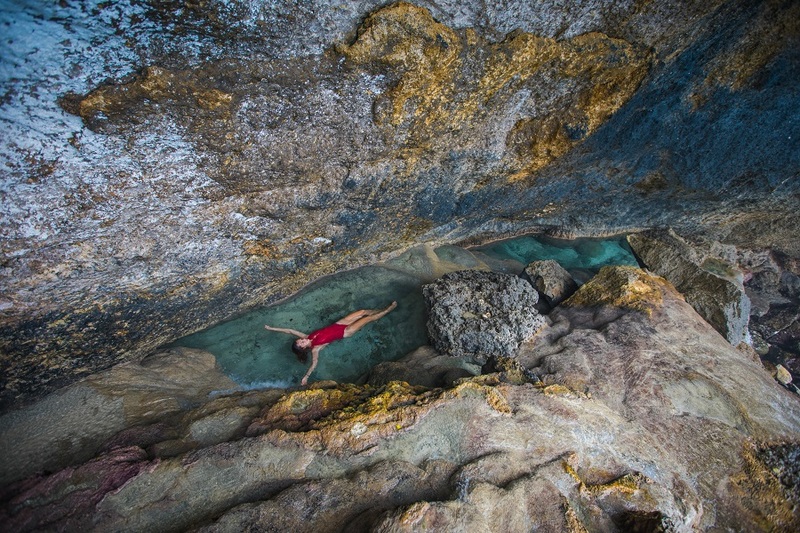 Broken Beach is a 10-minute walk up from Angel’s Billabong. It is best to come before 10 am or after 2 pm when most of the day tours are at Kelingking Beach. After a swim in Angels Billabong, a short walk to Broken Beach is one of the highlights on Penida. There is a massive archway from the ocean into this bay, which has perfectly clear water and beautiful coral. It is possible to walk across the archway to get a different view. There is no access down to the beach, but the pictures are amazing! Located on the western coast of Penida, Crystal Bay is home to high-end beach resorts and is known for snorkeling. Snorkel trips depart from Crystal Bay, with stops typically to Manta Point and Gamat Bay. Snorkel trips cost around 400k – 500k IDR per person. Several beachfront bungalows are available at Crystal Bay starting from 500k IDR per night. Although this is a popular spot on tours, the beach is underwhelming. 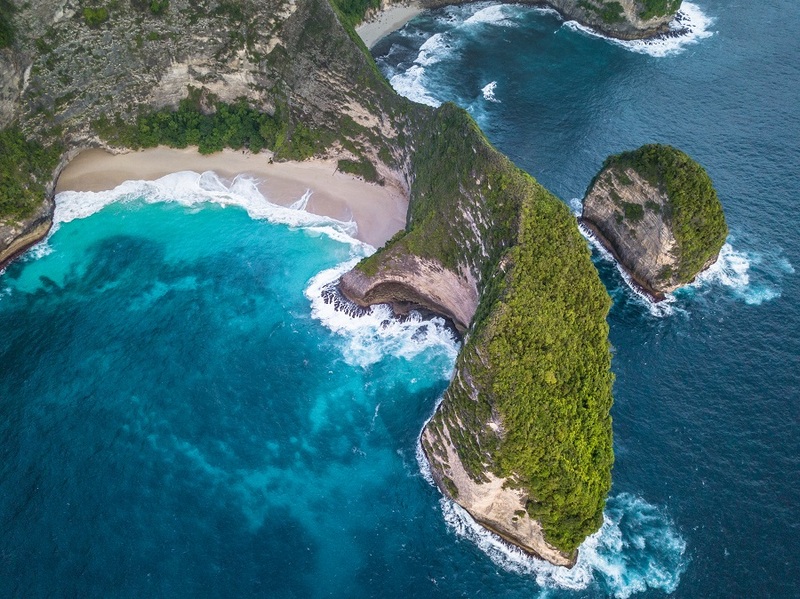 Manta Rays are in Nusa Penida year round. During the peak season between June and October, there could be dozens in the water at the same time. There are two ways to get in the water to Manta Point, by joining a snorkel trip or to scuba dive. 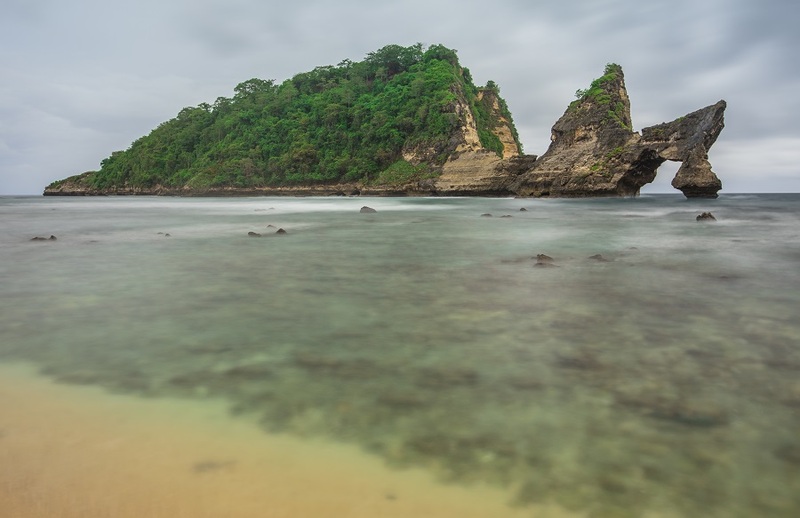 A snorkel trip to Manta Point costs around 130k IDR. We were able to find a package that included Manta Point, Crystal Bay, and the underwater Buddha Statues for 150k. 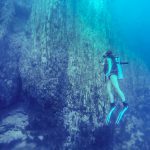 Scuba diving in Nusa Penida is another option. There are three dive shops on Penida on the north coast: Sanctum Dive Shop, Octopus Dive, and Blue Corner Dive. Diving starts from 500k IDR per dive. A quiet stop that you may have all to yourself, Banah Cliff has two panoramic viewpoints. Small clearings beside shrubs lead to straight vertical drops over 100 m high cliffs. The road is good until the last few kilometers. Located near Banah, this road narrows to a small rocky path. While it technically is driveable by scooter to the end, only those extremely confident in driving should attempt it. For the rest of us, walk around 30 minutes down to the bottom of the forest where there are two natural swimming pools, one for women and one for men. There is also access to the rocky beach. Sunset at Tembeling Beach. Photo by the Kuyjalan team. Hundreds of steps lead down to a temple on the side of a cliff, located just a few meters above the crashing waves. Waterfalls cascade down the cliff and around the ocean temple creating several waterfalls directly into the sea. The walk down is not for the faint-hearted or those scared of heights. 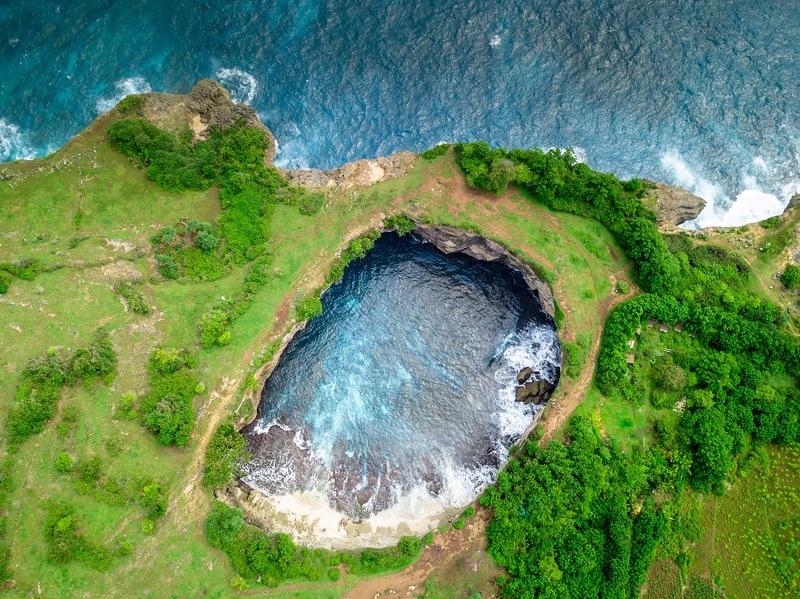 There are two natural pools for bathing at the bottom. Atuh is far from everything else, on the east corner of Penida. The panoramic views from the top of the cliffs are some of the best on Penida. The beach is gorgeous but very rocky. It is good for snorkeling at high tide, but at low tide, the beach is not accessible for swimming or snorkeling. 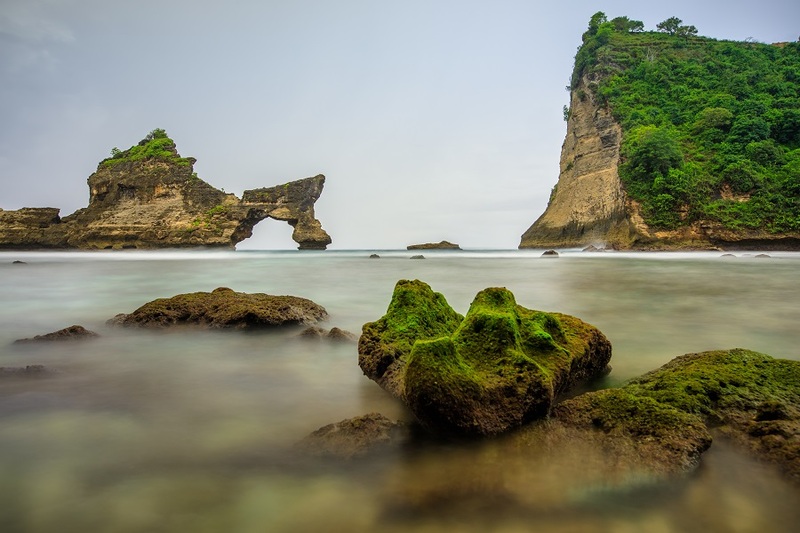 There are several picture-perfect rock formations at this beach. This is the perfect sunrise spot, although, with limited accommodation in the area, it is not the best place to stay for budget travelers. When making it all the way out to Atuh Beach, there are a few viewpoints to check out, and Raja Lima viewpoint is the best one. It is located down at the bottom of the hill at the “treehouses”. It costs $40 USD to stay the night, while the views are amazing, the huts are actually very basic. Not a bad place to wake up to though! The famous treehouses by Atuh Beach. Photo by Jason Reynolds. When I go to Indonesia next year, I’m going to keep this place in mind. I had never heard of it until very recently. Some of the shots looked like drone shots. Did you take them yourself? The map was really helpful! Nusa Penida is stunning, I highly suggest it! It is only a short ferry ride from Sanur, Bali. All of these photos were taken by me, yes, which several of them are drone shots as well. Glad you enjoyed it and look forward to hearing about your trip! Keep us posted. Stunning photos! 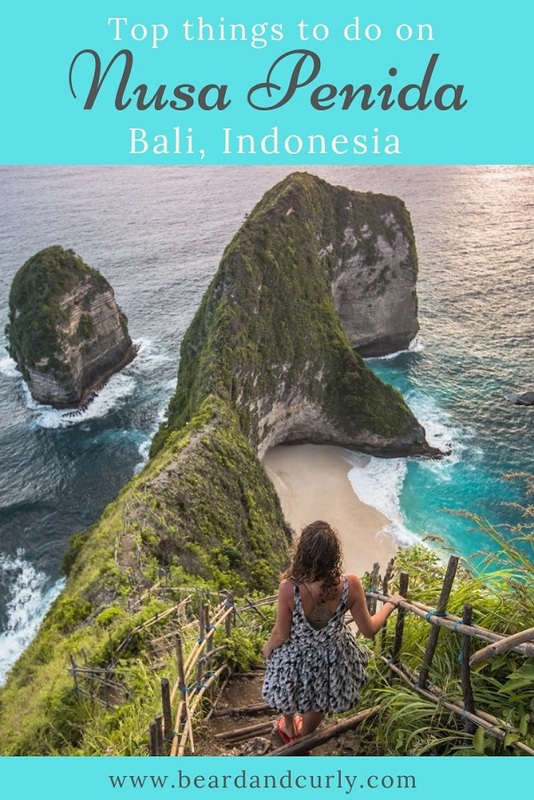 I’m going solo to Bali in a few weeks and Nusa Penida is high on my list of experiences. BUT I keep reading about the road situation and now I’m considering not going at all because I have no scooter experience apart from hopefully one week riding around Ubud. I would rather spend a few nights rather than a day trip – should I just get over my fear of scootering there and go? Or wait until I have a friend who can come with me and drive it someday?! This is an excellent questions, and honestly because of the time of year, something you need to consider. It is peak season, so that means lots of tourists, especially at Penida. I had a friend go just this week and said you could barely get a picture by yourself. They went on a day trip tour. I would suggest NOT going on a tour, personally it might not be worth it during August. Going independently is the way to go. There is really only 1 bad road, some roads need work done (potholes for sure), but the road to Angel’s Billabong and Broken Beach is pretty bad. Since it is not rainy season, it should not be muddy, which is a big plus. 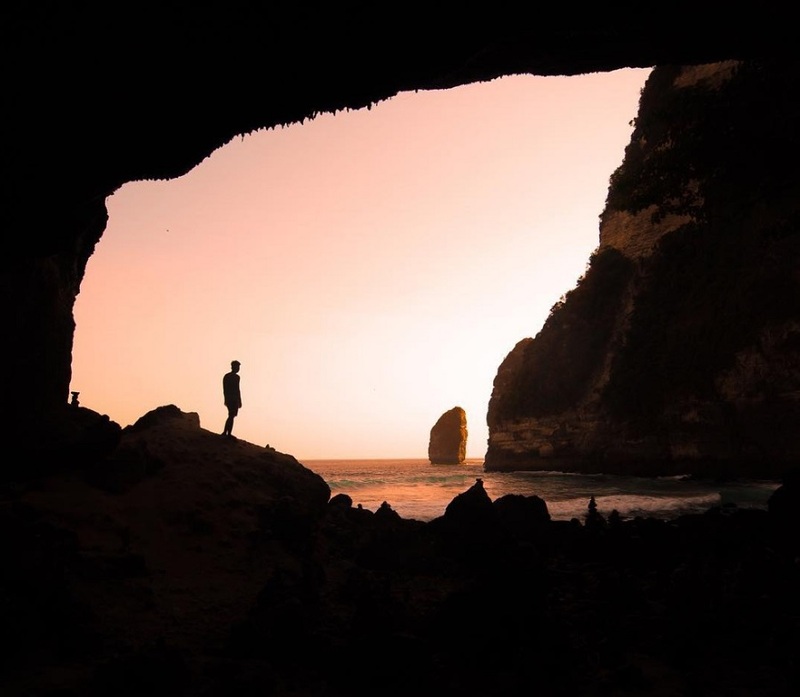 I think if you want to go, go independently and check out Broken Beach, Angel’s Billabong, and Kelingking Beach between sunrise – 10am, and then 4pm – sunset. Any other location on Penida will be fine. Loads of people go, maybe you can find someone to join you on Backpackers Indonesia FB group. Hope this helps. Stunning pictures!!! The private cove looks absolutly stunning! I have never heard of this place but now I’ll have to add it to the list! Thanks for sharing! Thanks so much! 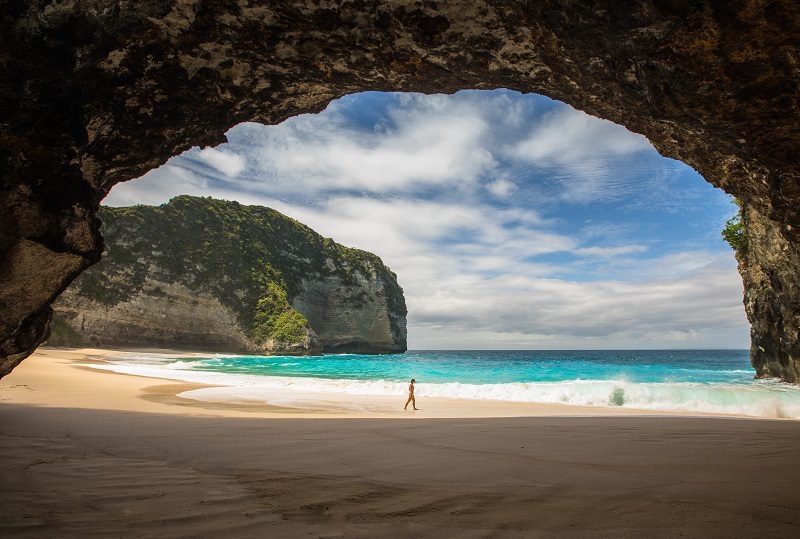 The cove is a beautiful spot at Kelingking Beach. Most don’t make it down there on the 45 minute hike (it is a little dicey), but it is totally worth it. The cove is just at the end of the beach. Glad you enjoyed it. The pictures are so pretty! I so wanna visit! Your welcome! Thanks for reading. Penida is a beautiful place and combined with Bali is a great holiday. We hope you come one day!